COMES WITH: Lifetime warranty. If anything goes wrong with your unit, the manufacturer will repair or replace it. The ReBuilder® is a medical device that sends tiny electrical signals to your nerves and muscles. These signals can wake up sleeping nerves and strengthen muscles. They travel from one foot, up the leg, across the lower back and then back down the opposite leg to the other foot. Then it reverses its direction and returns to the original foot. This action treats all the nerves of both legs and feet while stimulates the muscles of the calves to contract and relax to increase muscle tone and increase blood circulation. The ReBuilder® also stimulates the brain to release endorphins, which will relief the pain all over the body such arthritic pain and muscle soreness with no side effects. The EMS (Electronic Muscle Stimulation) setting is effective to strengthen atrophied muscles due to debilitating neuropathy pain. The ReBuilder® does the opposite of common TENS devices. While TENS devices block pain signals, the ReBuilder® opens up the nerve paths and re-educates them. The normal signals can finally get through. The ReBuilder® treatment increases the blood flow which causes muscle contractions and actual healing can be accomplished, not just masking the pain. 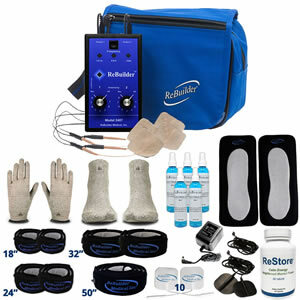 The Basic Kit comes with everything needed to begin immediately the neuropathy treatment. Electrically isolated output. This is a safety feature so that if an accidental short occurs due to dropping etc. within the unit, it cannot reach the patient. The output from the device is isolated from both the circuit board and the battery. The design of the battery compartment restricts the user to only a 9 Volt battery. Cross channel leakage is nil. The two output jacks operate on separate (but equivalent) driver circuits and individual transformers are used for each output. The timing circuit that sets the frequency and amplitude of the driver circuits is common to both driver circuits. this means each output is operating at the same frequency and amplitude while being driven by the separate electrical circuits. Both channels are running identical voltage profiles (i.e. there is no voltage difference from channel to channel that would promote cross channel leakage). Pulse shape: Asymmetrical, biphasic, with very short positive spike for nerve stimulation combines with a broad peak of longer duration for muscle stimulation. This is followed by a much longer negative curve. Because the area under the curves is equal, no residual charge remains in the nerve or muscle cell. This is a patent pending feature. This waveform exactly duplicates the waveform of a healthy nerve signal much the same as a pacemaker imitates a healthy cardiac signal. Pulse repetition rate: Switch-selectable: 7.83 Hz (±10%), 100Hz The pulse rate changes during the treatment session based upon biofeedback from the patient. As the nerve fatigues, it takes longer for the nerve to repolarize to be ready for the next signal. Current density = 1.39 mA/sq.cm. Power density = .082 Watt/sq.cm. The 7.83 Hz setting is designed to control pain by stimulating the large afferent nerves with a waveform that is an identical copy of a healthy nerve impulse. Included is a proprietary circuit that uses the Bose® concept for noise suppression that cancels out extraneous aberrations in the returning reflex nerve signal. The ReBuilder® has an additional proprietary circuit designed to automatically set its output parameters of current, frequency, and voltage limits depending on the patient's measured resistance and capacitance. The patient's physician may elect to instruct the patient to use accessory conductive garments or a water-filled footbath. With the conductive garments, the entire skin area of the foot is treated which distributes the signal and ensures a suitable comfort level. Also available are conductive gloves for the hands. A twin compartment footbath dilates the capillaries of the foot via the warm water to enhance local blood flow to the skin if the physician feels the need for increased blood flow to the skin, perhaps with a patient with diabetes, PAD or PVD. There are other DC components in the signal that re-set the set points of the nerves. This calms down overactive nerves and wakes up underactive nerves. Certain proprietary aspects of the output signal are withheld and it is these aspects that are primarily responsible for the success of the ReBuilder®. Note: It is extremely dangerous to use a common TENS or EMS device to treat neuropathy as it can overload the nerves causing permanent damage because the patient can not feel it properly. The ReBuilder® is processor controlled and has real-time biofeedback functions built in that read the patient's electrical parameters and makes constant adjustments to match the patient's immediate nerve function. Dimensions: 3" x 1.5" x 6.5"